Burning Moon's Inside advice: Starlight Wraps Review & Giveaway! Starlight Wraps Review & Giveaway! I generally don't wear a lot of jewelry I am very selective in what I will wear, but I've been wanting a bracelet for a while something that isn't too large, doesn't make noise and isn't going to catch on my clothing. While on my hunt for a new bracelet I found a company called Starlight Wraps who sells wrap bracelets in an assortment of colors. The company owner Rexann was kind enough to provide a little background on how her company came to be: " She is also the owner of a small clothing boutique in Estes Park, Colorado and in September of 2013 they were hit by a devastating flood and were virtually closed for almost 3 months. 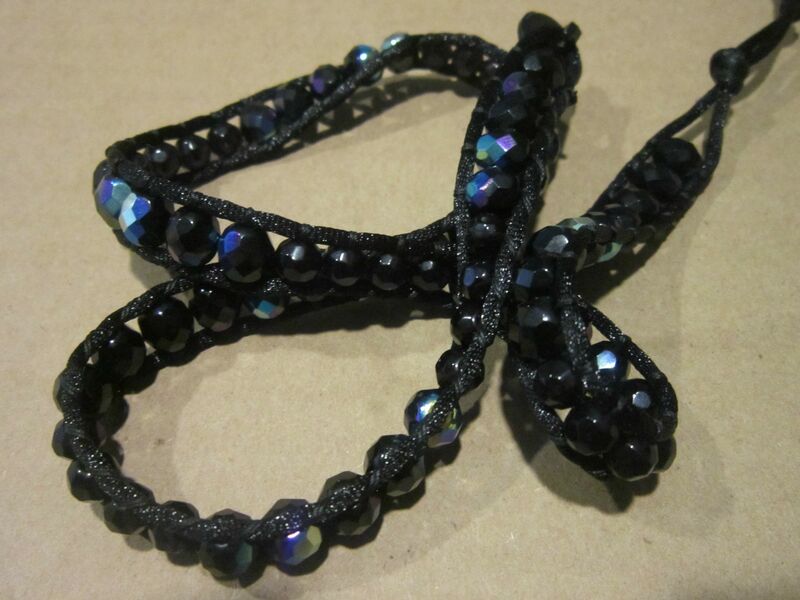 She had always enjoyed jewelry design as a hobby prior, but with some extra time on her hands while the roads were being repaired in her city, she decided to create Starlight Wraps. It has been a wonderful whirlwind for her since the beginning and she is so excited about the future of Starlight Wraps and hopes it continues to grow! Each piece in her collection is designed and handmade with great attention to detail. Starlight Wraps is also dedicated to supporting various children's charities around the world by donating 20% of her net proceeds each year. They believe in striving to make a difference in the lives of children everywhere." 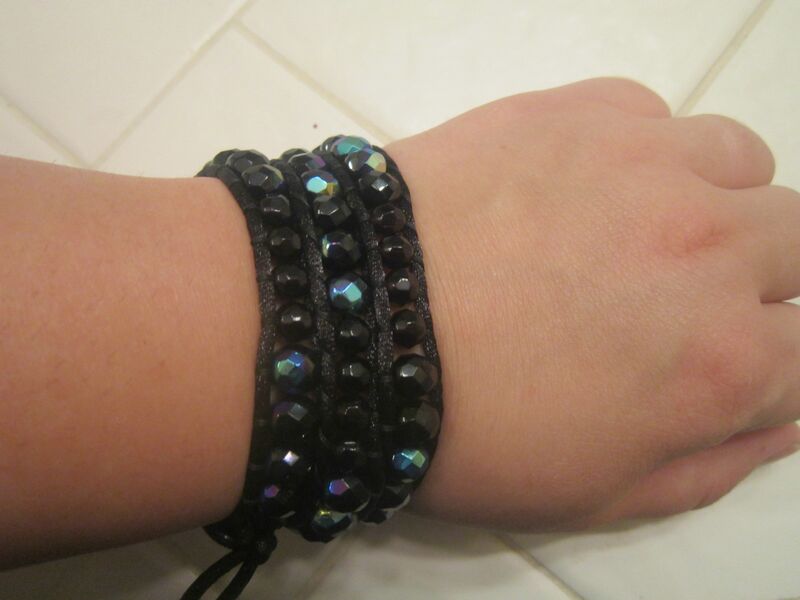 For my review I received a Stella wrap which is a gorgeous 3 Wrap Bracelet with black iridescent and dark purple beading. If you are indoors the purple beads appear more black but once you are out in the sunlight they shine a deep purple which looks quite beautiful. My bracelet arrived quickly and was sent in a cute draw string back which I will keep for future gifting. The bracelet seems like it could weight a bit however it feels almost weight less I sometimes forget I am wearing it, I typically don't sleep with it on because I don't want to risk it becoming lost in my sheets if it were to come off. Breakage wise I don't think it is likely it will break unless someone where to take a pair of scissors or a knife to your bracelet, My one and a half year old was trying his best to try and get the bracelet off my wrist and it didn't budge. It is easy to put on and take off with just one hand so you won't need anyone to assist you and it has three different lengths you can adjust it to depending on how tight you would like to wear it, I wear mine on the second loop. I have enjoyed working with Starlight Wraps and think you should head over to check out all of the beautiful wraps she has to offer. One lucky winner will win the 5 wrap Cassiopeia, the retail value is $35 shown in the last image above. 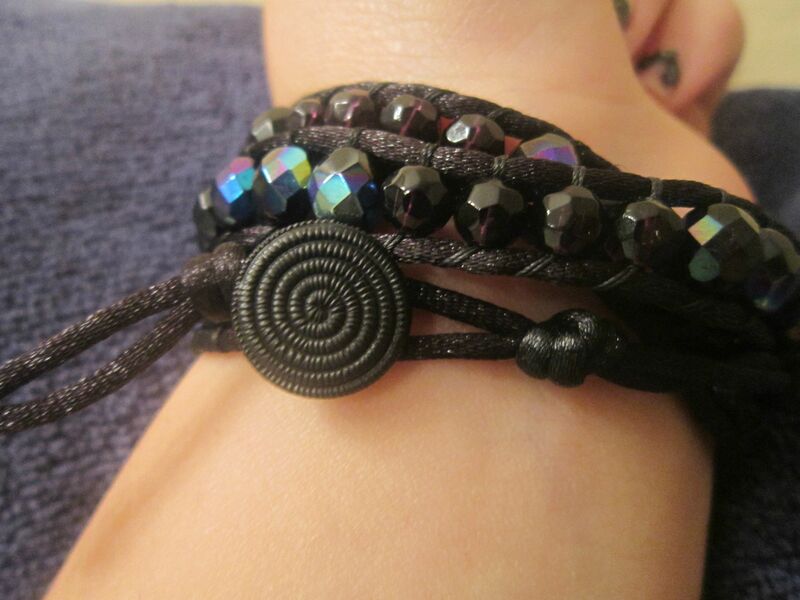 I really like the Carina bracelet! These wraps are so beautiful! They can be dressed up or down! I like the Perseus bracelet. I really like the Lyra wrap. It looks magical. I like Mira Starlight Wraps! Cooper & Kid Review and Giveaway! Flytes of Fancy Review & Giveaway!